To post on this channel directly, please become a "Point of Contact" for your institution from HERE. To get all attachments, register with The Scientific Indian HERE. Posts cannot contain attachments. 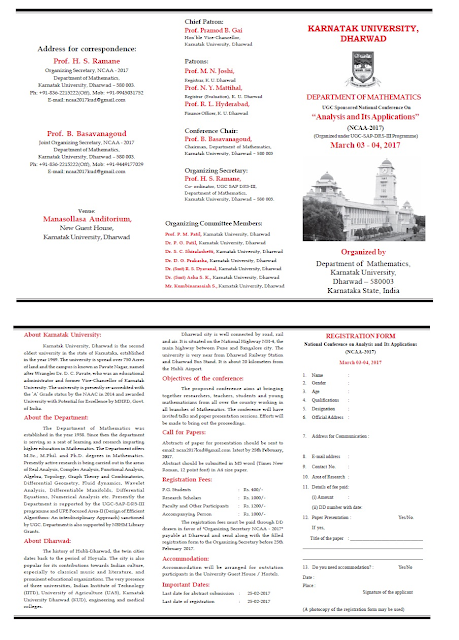 The Department of Mathematics, Karnatak University, Dharwad is organizing a National Conference on Analysis and its Applications during March 3-4, 2017. Kindly circulate the attached brochure among interested people. To get all attachments register with The Scientific Indian HERE. Posts cannot contain attachments. Become a "Point of Contact"